A Mother’s Day trip down the memory lane of 1950/60’s children’s meetings, Gospel meetings and Sunday Schools around Ashfield and Dromore. For me, it really was a trip down memory when on a lovely Sunday afternoon, 6th March 2005, I took the short walk up the lane to Mount Ida Orange Hall, recalling happy times spent at Children’s Meetings held in the hall every Monday evening in the 1950/1960’s; then visiting other places around Ashfield and Dromore where I attended Sunday Schools and Gospel Meetings. It was particularly poignant that it was Mothering Sunday allowing to recollect how my mother, the late Mary Emily Kelly (nee Harvey) ensured that I got a solid Christian upbringing. The Children’s Meetings at Mount Ida Orange Hall, known to some as the ‘Cradle Hall’ due its cradle-like shape, started in 1953 under the leadership of Mr Cecil Alderdice. When I started to go to the meetings in the early 1960’s, they were conducted by the late Robert and Mrs Graham, founders of Graham’s Home Bakery, Dromore. Robert Graham drove round the surrounding country areas in a big old bus, picking up children at various stops. My stop was at the end of Mackey’s lane, where I was picked up along with the Harvey and McCauley children. The chat and fun on the bus was great and also the short walk up the wee lane to the Orange Hall. In those days, the old hall had it’s own electricity generator, and I can well recall sitting at the meetings with the electric lights flickering furiously; and in the quietness of the meeting, listening to the continuous purr of the electricity generator. In the den of lions. Fears could not alarm him. The children did not sing the word ‘SHUT ’ and like the lions, they shut their mouths when you came to this word. If however someone did sing the word SHUT, they were the brunt of much banter from the other children. I am saved by Grace Divine. After the children’s meeting was over, it was back on board Robert Graham’s bus for the short journey home. In about 1964/5 the meetings moved to a large wooden hall beside Ashfield Post Office, and in about 1999 the meetings moved to Dromore Gospel Hall. The big old bus was replaced with a 17-seater minibus in 1964. Sadly, Mrs Graham died in 1991 at 69 years of age and Robert died in 1995 at the age of 76, but many people will remember many happy evenings spent with them at Mount Ida children’s meetings. My next call was at Quilly Orange Hall where an afternoon Sunday School has been held since about September 1949. My father Andy Kelly was one of the teachers in those early days and when I attended the Sunday School in the 1950’s/early 1960’s, the superintendent was Willie Poots who after his death, was succeeded by Willie Thompson. The Sunday School Teachers included: Bob Beggs and his wife Mrs Ellen Beggs, Jim Beggs, Sam Thompson, George McKee, Bertie Black and my aunt - Minnie Kelly, who lived just about 150 yards from the hall. 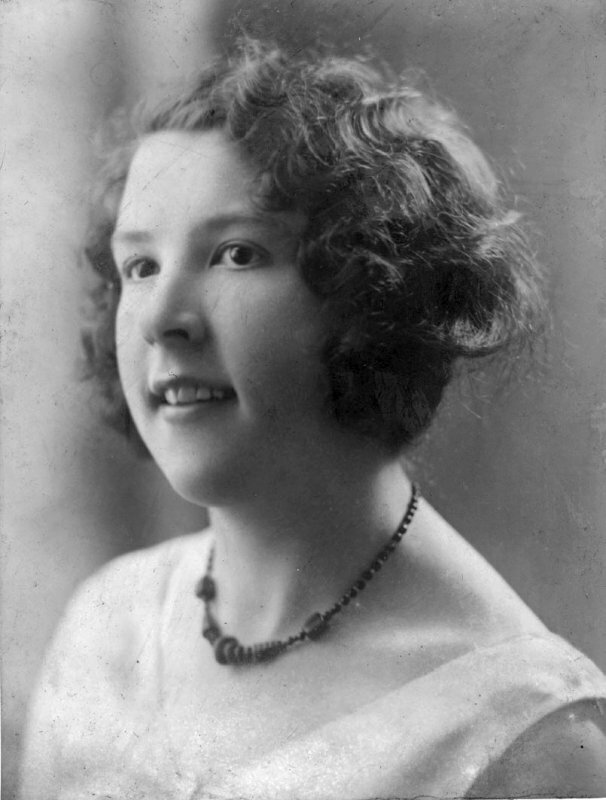 After a few hearty items of praise from the “Golden Bells” songbook accompanied by Mrs. Rosemary Allen on the organ, it was a case of taking your seat on one of the two inward facing long uncomfortable forms so that the teacher could take the lesson. The Sunday school was very well attended, with children arranged in about six to eight classes of varying age groups, with about 6 to 10 children in each class. For me, two very important items in the Sunday School calendar was the scripture examination and the annual distribution of prizes. The examination involved learning a passage of scripture and reciting it to an examiner, one of the teachers. Most of the young children tried to be strategically placed in the queue so that Bob Beggs would be the examiner. Bob was a very kindly Christian man and it was generally felt that he would be more lenient than most in marking. After saying your portion of scripture, which you had struggled for weeks to learn, it was great relief to hear Bob say, “Well done, 100%”. Sadly, Bob Beggs died in 1975 at 61 years of age and I have no doubt that he would have received the, “Well done Bob, 100%”, from his Lord and Master whom he served so faithfully every week at the afternoon Sunday School in Quilly Qrange hall. The annual prize distribution was held on a Friday evening when a really wonderful supper was served. Led by the superintendent Willy Poots, it was like a Children’s Concert involving most, if not all children taking an active part in some way or another, whether reciting a poem, singing a solo, duet, or with a group of singers. The musical direction was in the capable hands of Mrs. Rosemary Allen. As a young boy, even though I must have read the verse many times for many years, it did not mean a lot to me in those days, but after seeing the Mel Gibson film “The Crucifixion” in Easter 2004, it was painfully obvious just how much Christ was wounded for our transgressions, and how much he was bruised for our iniquities, and how he bore the stripes of many beatings so that we can be healed. A six-week Gospel Mission was held in Quilly Orange Hall in February/March 1954 and when it ended, Gospel Meetings were held in the hall every Wednesday evening and have continued ever since. My mother and I regularly attended these meetings in the late 1950’s/early 1960’s when once again the items of praise were taken from the “Golden Bells” hymnbook and accompanied by Mrs. Rosemary Allen on the organ. The meetings were well attended, and Bob and Ellen Beggs arranged the various guest speakers. With not too many television sets in the country in those days, the highlight for me was when one of the guest speakers showed a film of for example, their missionary work overseas. 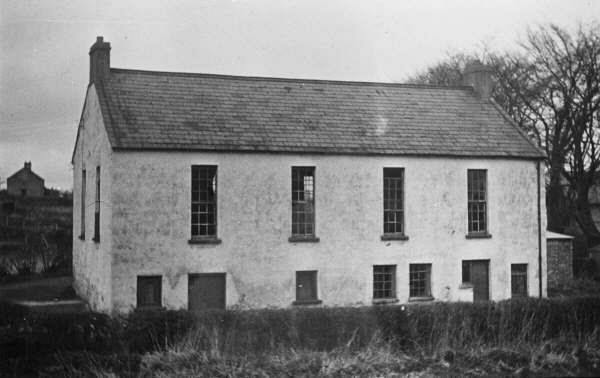 After calling at Quilly, I went to the Mills at Dromore, where my mother used to take me to a Penticostal Meeting that was held every Sunday evening in a hall, commonly called “The Hut”. The owners of the bungalow that was built on the site informed me that the hall was demolished in about 1983 and explained the difficulty they had in tracing the original owners of the property. My recollection of these meetings is that they were lively with great singing and the plain and simple preaching of the Gospel by a band of dedicated leaders keen to share their Christian faith. 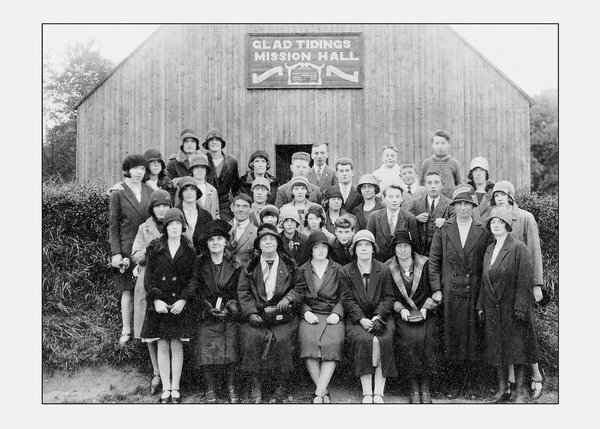 (Pictured at The Glad Tidings Mission Hall at the Mills, Dromore in about 1930 are L to R: (front row) Maisie Jackson, Mrs. Magill, Miss Morrell – Missionary, Miss Hearsey, Mrs. Thomas, Mrs. Hunter, Mrs. Miskimmons and Miss Lilley. (second row) Barbara Ireland, Ena Purdy, Sammy Lunn, Minnie Beggs, Madge Miskimmons, Tina Jackson, Willie Purdy, Bobby Baxter, Sam Miskimmons, Evelyn Harvey and Mary Emily Harvey. (third row) Aggie Harvey, Maggie Harvey, Miss Kilpatrick, Maggie Hunter, Minnie McDowell, Mrs. Morrison, Mrs. Taylor and John Beggs. (fourth row) Ella Gibson, May Purdy, Mrs. McGrath, Sam Black, Billy Marshall, Tommy Kerr, Wilfie Taylor and Billy Hunter. After visiting the site of the Pentecostal Hall, my fourth and final Mothering Sunday call was to First Dromore Presbyterian Church where my family worshipped for many years. I visited Mr John McGrehan, and had a most informative chat recalling my father’s years as an Elder and reminiscing about the morning Sunday school at First Dromore where John gave fifty years exemplary service; twenty years as Sunday School teacher and thirty years as Superintendent. Sunday Schools at First Dromore date back to 1837 and it would appear that they were held in the Old School. History shows that in those early days, some people came to church by horse and trap and the horses were stabled in part of the ground- floor of the two-story building during the church service. John McGrehan explained that when he was a young boy he attended the Old School, which in his childhood days was called Dromore No. 3 National School, later to become the Public Elementary School. When I attended Sunday School at First Dromore, the primary Sunday School was held in the Choir Room at the rear of the Church. In about 1956, I moved to the ‘Big Sunday School’ that was held in the Old School which by then, was showing every sign of wear and tear. I can clearly remember the old coke-burning stove in the middle of the hall that must have been lit hours before the Sunday School in order to generate enough heat during the winter months. The Old School at First Dromore Presbyterian Church, erected in 1860. It was demolished in the late 1950’s and a Church Hall built on the same site was opened in 1960. The new Church Hall at First Dromore Presbyterian Church opened in 1960. The building was demolished in the late 1950’s and when my Sunday school class moved into the new Church Hall in about 1960, my teacher was Miss Sadie Stronge. My class included sons of well-know Dromore shopkeepers - Alexander Thompson, whose parents owned a greengrocer shop in Gallows Street; and Peter Osborne, whose parents owed a confectionary shop in the Square. 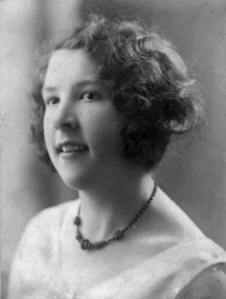 We were all very fond of Miss Stronge and even when we were well into our teens, and the age to attend Bible Class, we stayed an extra year in her class where we continued to gain tremendous Christian teaching from this devout Christian lady. Sadie Stronge, who was renowned for calling her well-read Bible - “Her Sword,” was Sunday School teacher at First Dromore for 45 years. 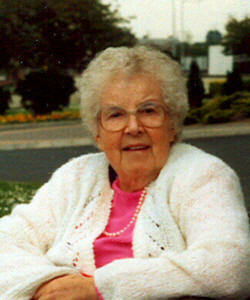 Sadie died in February 1997, but will be well remembered by many people for many years. After leaving Miss Stronge’s class I attended the Boys’ Brigade Bible Class for several years, coming under the expert tuition of the minister, the Rev. F. L. McConnell. Mr McConnell conducted my father’s funeral service in April 1984 and died a few weeks later. 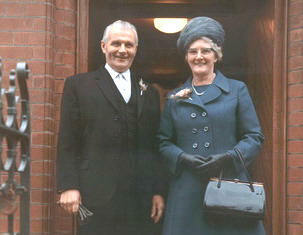 John McGrehan, who is now 92 years of age, became a Sunday School teacher at First Dromore in 1934. When Mr. James Baird retired as Superintendent in 1954, John was asked to be his successor. In his modesty, John was reluctant to accept the position over more senior teachers, but after a meeting of all the teachers, he was assured that they all supported his nomination. Still reluctant to accept he said that if he was proposed and seconded by the Kirk Session, he would accept the position. At a Session meeting in 1954 he was proposed by John McDonald and seconded by Carson Cardwell and unanimously elected. John McGrehan remained as Superintendent for the next 30 years and he was succeeded in 1984 by Hugh Scott. John was also a most loyal and faithful elder of First Dromore. Since his ordination to the Eldership in 1946, he was Secretary of the Congregational Committee for thirty-eight years and Clerk of Session for twenty years. L to R: The Rev. F. L. McConnell - Minister of First Dromore Presbyterian Church, Miss Sadie Stronge - Sunday School Teacher and John McGrehan - Sunday School Superintendent. My mother was never happier than when she was attending midweek Gospel Meetings in Quilly Hall or the Sunday evening Gospel Meeting in the Penticostal Hall, Dromore. She had a tremendous simple Christian faith and loved to sing the old familiar Gospel songs from the Golden Bells hymnbook including: ‘The Gospel Bells are ringing’, ‘Wash me, cleanse me in the Blood that flows from Calvary’, and a personal favourite of mine: ‘Pass me not oh gentle Saviour, hear my humble cry, while on others Thou art calling, do not pass me by.’ I have the full confidence to know that the Saviour did hear my mother’s humble cry, and while on others He was calling, I am absolutely certain - He did not pass her by. 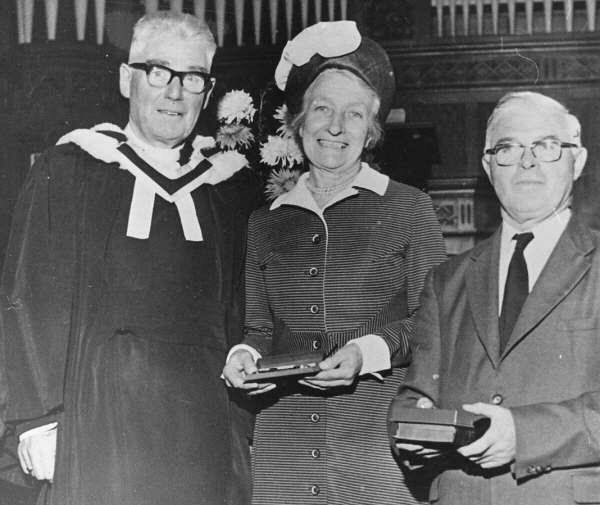 She passed away on 3rd July 1990, and at her funeral service in First Dromore, the magnificent church organ, superbly played by Mrs Gertrude Jamieson, resounded with great old Gospel hymns from the “Golden Bells” hymnbook. These exemplary Christian servants have left “Footprints in the Sands of Time” for many children for many years, in Dromore and the surrounding areas. I treasure my early Christian upbringing at these places of worship, and enjoyed my Mother’s Day trip down memory lane recalling happy times spent at these children’s meetings, Gospel meetings and Sunday Schools. My sisters, Marjorie and Vera joined Quilly afternoon Sunday School when it began in 1949. They took part in the first Quilly Sunday School Social on 23rd December 1949 in Quilly Orange Hall. After a delightful tea served by the teachers, the young people presented the following programme: Opening recitation by Anna Martin; choir - “I am so glad”; solo - Phyllis McCready; choruses - Junior Choir; duet - Phyllis McCready and Isobel McCandless, solo - Marjorie Kelly; organ recital - Margaret Hull; choir - “Jesus loves me”; recitation - Sadie Poots; trio - Phyllis McCready, Isobel McCandless and June Orr; recitation - Isobel Beggs; choir - “While Shepherds watched”; solo - Isobel Beggs; recitation - Vera Kelly; choir - “Once in royal David’s city”; solo - Isobel McCandless; choir - “O come all ye faithful”. They desire the good of all. Should have this Sunday School. Is the prayer of its superintendent. God has for every child a place. To the borders of Gill Hall. From the highlands of Ballaney. And sit at Jesus’ feet. That nobly do their part. And He makes no mistakes. And placed his servants here. That leads to the Heavenly Land. His worth no tongue can tell. Doing all for Jesus’ sake. And that’s just Robert Beggs. To love God’s Holy Word and Day. The hand of Mrs. Clarke. Is the aim of Bertie Black. By our gracious young Mrs. Allen. And win the young for Jesus. On that coming crowning day. Passing through Quilly, calling today. Mighty to save, to cleanse, and deliver. Wonderful Jesus, coming your way. Bring Him your sins, and bring him your sorrows. Precious the Blood that can make you free. Trust Him today, – for every tomorrow. Wonderful Jesus. Calling for thee. Article written by: John A. Kelly, previously from Mackey’s Lane, Ballaney, Dromore (1948 – 1964) and later Barban Hill, Dromore (1964 – 1969), and now living in Lisburn.